The matrilineal Fante are members of one of the most populous ethnic groups in Ghana, the Akan. They are the dominant group in the Cape Coast area and have a long history in the region. They are Fanti speakers, but also speak the national language, which is English. 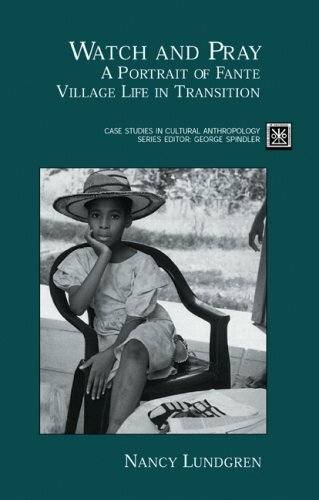 This case study provides an intimate look at the Fante, who now reside in towns and villages, are predominantly Christian and earn their living primarily as traders, farmers and fishing people, but are found in all walks of life including: government officials, teachers, University professors, lawyers and doctors. The people of Akotokiyr and Abaasa and Nim want readers to know about their villages and the people associated with them because they represent a spirit and a tradition and a collaborative lifestyle that are rapidly changing. The book makes it possible for readers to become participants in the sceneâ€”be it in a home, a "palace" of a chief, a church, in the market place, or in the authorâ€™s own homeâ€”where they can see firsthand the ways in which the new is being incorporated into the old. As the Series Editor says, "the blazing sun, the airless rooms with concrete block walls with roofs of sheet iron, the dust, flies, rough streets, the verdant forest, the streams the open, running sewers, all become habitats of our minds as we read of the author's interactions with people in the small villages where she is living and working." "Watch and Pray" was assigned for my Cultural Anthropology class during the section on globalization. Overall the book was a decent easy read but at times it felt repetitive. What I was most impressed about was how fast it arrived. I forgot to order it with my other books at the beginning of the year and I needed to do a project on it by December 1st. I didn't order it until 2 A.M. November 25th and received it by 8 P.M. on November 26th when I chose the one day shipping. I really didn't expect it to arrive on time especially with the holidays!! Ordering it on Amazon was also much cheaper than buying it at my school bookstore even with the express shipping.